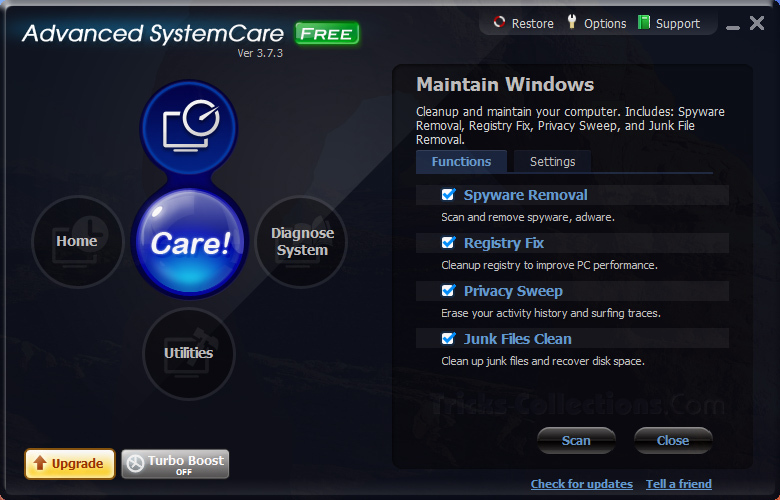 The iObit Advanced SystemCare free provides everything you need to optimize, clean, repair, protect your PC. The free tool in this iObit software such as Registry Repair, spyware removal, junk file remover and more and this software available for free. 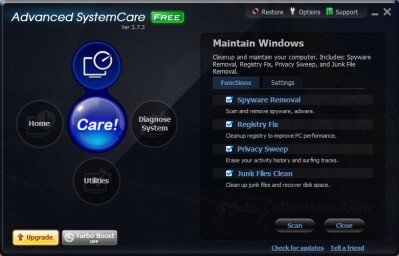 Advanced SystemCare (also called Advanced WindowsCare) is free PC repair software with powerful features and this software is one of the most downloaded software in Cnet Top 10 Download list of 2010 (Advanced SystemCare ranked #7). The latest version Advanced SystemCare 3.7.3 has fully compatible with Windows 7 and it support for 32bit and 64 bit windows version. The latest version has several improve features such as Registry Fix module, Removed NetworkMon beta and Fixed general bugs and this software 100% safe with no adware, spyware, or viruses so you do not have to worry about when using the software. I highly recommend the Advanced SystemCare free version if you want a free Windows utilities with powerful features but the free version is free for non-commercial uses. Activate Registry Deep Clean features for maximum performance. Ultimate System Speedup for ultimate system performance. Enhanced Disk Defrag with fast, powerfully and incredibly effective Disk Defrag functions to optimize hard drives. Automated Care when PC is idle and you can schedule as you wish. Automated Privacy Sweep every time you log on to your PC to protect your PC privacy. Fast Automatic Update, get updates automatically and fast in the background. You can download iObit Advanced System Care Free here: Download Advanced System Care Free.